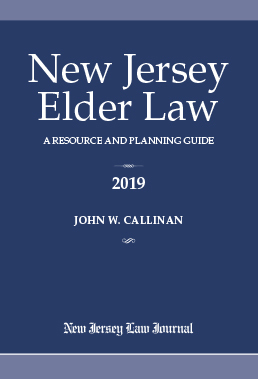 If you are interested in learning more about New Jersey elder law, I have written a book on the subject entitled New Jersey Elder Law: A Resource and Planning Guide. ALM Media Properties, LLC, publishes my book. ALM is the publisher of the New Jersey Law Journal, New Jersey's premier legal periodical. You can purchase my book by visiting The Law Journal Press. New Jersey Elder Law is a compilation and examination of professional and non-legal resources and services available to meet the needs the elderly. Callinan covers such areas as estate-planning, wills, trusts, guardianships; protection against elder abuse, neglect, and fraud; end-of-life planning; all levels of disability and medical care; retirement planning, Social Security benefits; Medicare and Medicaid coverage; Medicare planning; consumer protection, nursing homes, and in-home care; powers of attorney; physicians' or medical care directives, and declarations. It is a great resource for Law Firms, Libraries, Social Service Agencies, Private Care Facilities, Mental Health Professionals, and Accounting Firms. Available as an eBook, New Jersey Elder Law contains hyperlinks to the full text of cases, statutes and other authoritative content. The eBooks are compatible with a variety of devices and readers, including Apple iPad or iPhone, SONY Reader, Barnes & Noble NOOK and Adobe Digital Editions for PC and Mac. Purchase New Jersey Elder Law: A Resource and Planning Guide at The Law Journal Press.